Bright is one of Grumpy’s premier joys in life. Few fall plants lacking fall color appeal find their way into my garden. 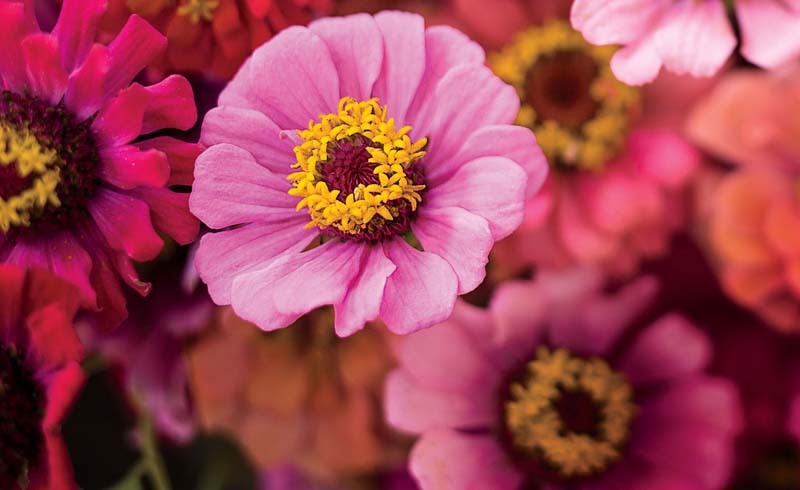 Here are four easy growers that put on a show this year. 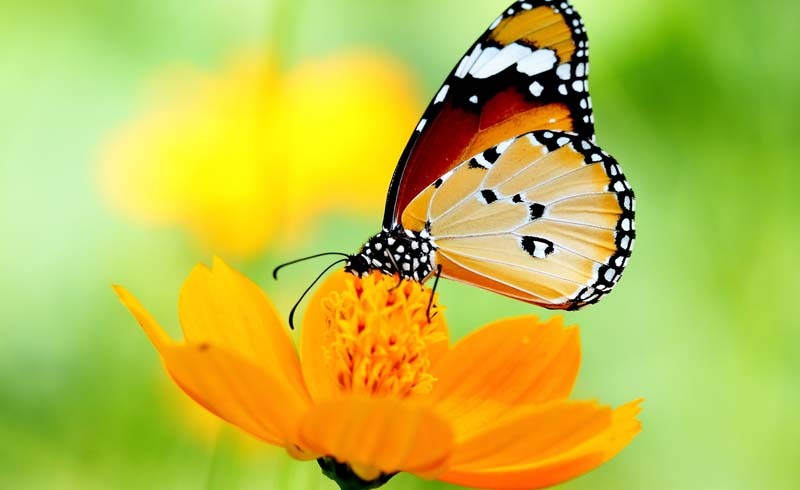 Now is a great time to add one or more to your garden. Because their roots are still growing, , trees, and shrubs get a head start on those set out in spring. 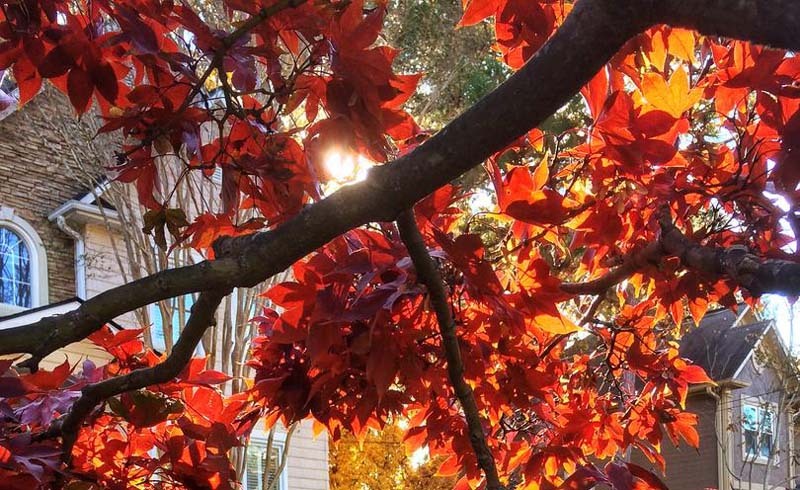 Japanese maple is the for most yards. It grows rather slowly and doesn’t get big, so you’ll hardly ever have to prune or move it. It comes in multitudinous forms—upright, weeping, dwarf, etc.—and leaves may have smooth edges or be finely dissected. Foliage often emerges one color in spring, changes to another in summer, and finishes brilliant red, orange, or yellow in fall. For best color, plant in full sun to light shade in fertile, well-drained soil. Among my favorites: ‘Emperor 1’ (upright; 15 feet tall; deep red foliage in spring and summer changing to sizzling scarlet in fall), ‘Fireglow’ (upright; 12-15 feet tall; blazing red foliage in spring and fall, deep maroon in summer); ‘Crimson Queen’ (weeping; 3-4 feet tall and twice as wide; finely cut, crimson foliage in spring turns burgundy green in summer and bright red in fall); and ‘Sango-kaku’ aka coral-bark maple (upright; 25 feet tall; grows quickly; coral-red twigs and branches; lush green foliage in spring and summer turns bright yellow in fall. This large, native shrub is one of the most underappreciated I know. Multitrunked and growing about 15 feet tall and wide, it thrives in sun or light shade and well-drained soil. Large leaves turn bright yellow and gold before they drop in fall. 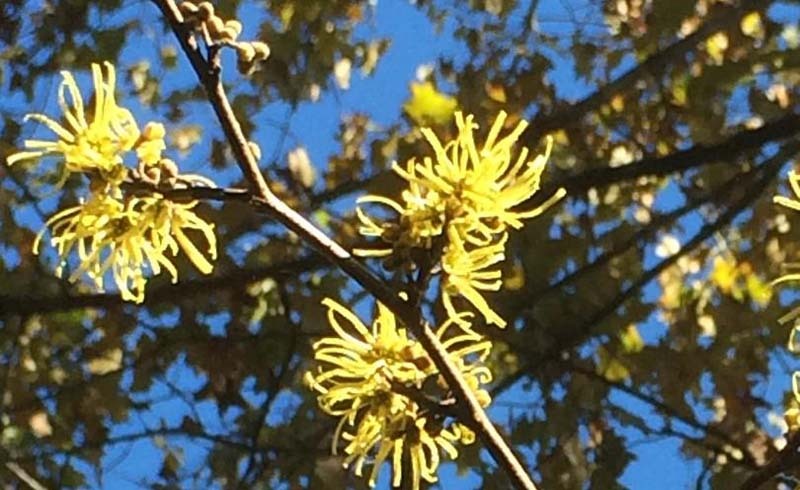 When they do, they reveal clusters of fragrant, bright yellow flowers resembling eyelashes all along their branches. ‘Little Suzy,’ a compact selection growing 4-5 feet tall, is especially floriferous. 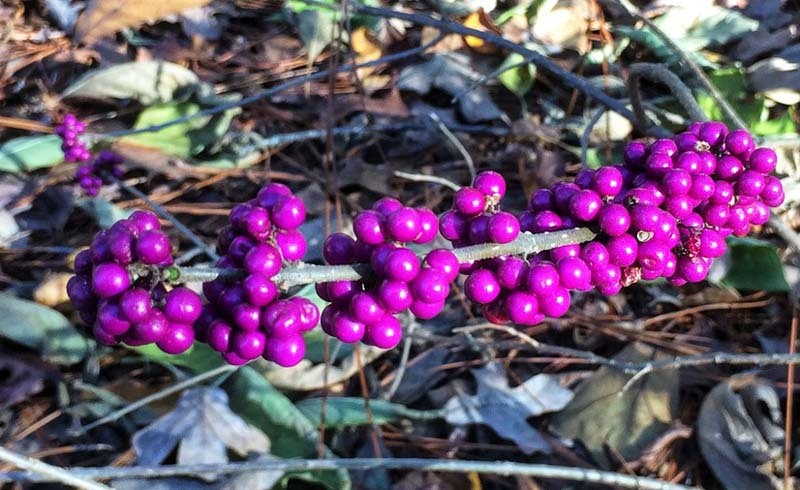 A feast for the eyes as well the birds, our native American beautyberry bears tiny in summer that give rise to imposing clusters of bright purple berries in late summer and fall. The shrub grows about six feet tall and wide and thrives in sun or light shade in either well-drained or moist soil. It becomes open and unkempt with time, so prune it back by half or more in winter. The berries are edible—some folks make pies and jelly from them—but I leave mine for my feathered friends. 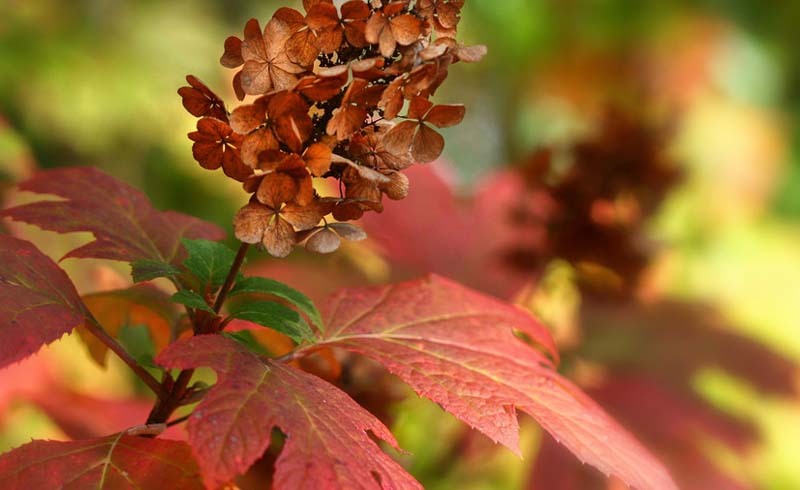 ‘Ruby Slippers’ is a compact selection of our native oakleaf hydrangea. It grows about 3-4 feet tall and wide. Upright spikes of showy flowers open white in late spring to early summer and then age to reddish-pink. Large, oak-shaped, deep green turn pink, scarlet, and burgundy in fall. Give this shrub light shade and acid, well-drained soil.